The A-135 (NATO: ABM-3 Gorgon) anti-ballistic missile system is a Russian military complex deployed around Moscow to counter enemy missiles targeting the city or its surrounding areas. It became operational during 1995. It is a successor to the previous A-35, and complies with the 1972 Anti-Ballistic Missile Treaty. The A-135 system attained "alert" (operational) status on February 17, 1995. It is operational although its 51T6 (NATO reporting name: SH-11) component was deactivated in February 2007. A newer missile (PRS-1M) is expected to replace it. There is an operational test version of the system at the test site in Sary Shagan, Kazakhstan. 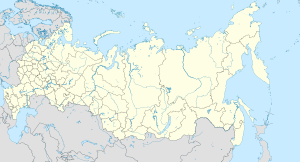 The system is operated by the 9th Division of Anti-Missile Defence, part of the Air Defence and Missile Defence Command of the Russian Aerospace Defence Forces. A-135 consists of the Don-2N battle management radar and two types of ABM missiles. It gets its data from the wider Russian early warning system which is sent to the command centre which then forwards tracking data to the Don-2N radar. The Don-2N radar (NATO: "Pill Box") is a large battle-management phased array radar with 360° coverage. Tests were undertaken at the prototype Don-2NP in Sary Shagan in 2007 to upgrade its software. 68 launchers of short-range 53T6 (NATO: SH-08 "Gazelle") endoatmospheric interceptor nuclear-tipped missiles at five launch sites with 12 or 16 missiles each. Designed by NPO Novator, similar to US Sprint missile. These are tested roughly annually at the Sary Shagan test site. Currently decommissioned 16 launchers of long-range 51T6 (NATO: SH-11 "Gorgon") exoatmospheric interceptor nuclear-tipped missiles at two launch sites with 8 missiles each. A memo from the archives of Vitalii Leonidovich Kataev, written around 1985, had envisaged that the system "will be completed in 1987 to provide protection from a strike of 1–2 modern and prospective ICBMs and up to 35 Pershing 2-type intermediate-range missiles". 2017 successful tests of the interceptor 53T6. Target speed 7 kilometers per second (53T6 speed 3), acceleration overload – 100 G, preload maneuvering – 210 G.
Two Daryal-type (NATO: 'Pechora') bistatic phased-array early warning radars, deployed at Pechora and Gabala Radar Station (closed in 2012) in Qabala, Azerbaijan. Dnepr (NATO: Hen House) radars at Mishelevka (Irkutsk), Olenegorsk, and Balkhash, Sary Shagan, Kazakhstan. US-KMO, US-K and EKS satellites. Command, control, communications and intelligence services. The successor system, dubbed 'Samolet-M' (and more recently A-235) supposedly will employ a new, conventional, variant of the 53T6 missile to be deployed in the former 51T6 silos. The new PRS-1M is a modernized variant of the PRS-1 (53T6) and can use nuclear or conventional warheads. It can hit targets at ranges of 350 km and altitudes of 50 km. ^ a b "Encyclopedia Astronautica Index: 1". www.astronautix.com. ^ a b c "Система А-135 ракета 51Т6 - ABM-4 GORGON - MilitaryRussia.Ru — отечественная военная техника (после 1945г.)". militaryrussia.ru. ^ Sean, O'Connor, (12 December 2009). "Russian/Soviet Anti-Ballistic Missile Systems". ^ a b c d e f g O'Connor, Sean (2012). "Russian/Soviet Anti-Ballistic Missile Systems". Air Power Australia. Retrieved 2012-04-30. ^ "Russia tests anti-ballistic missile meant to protect Moscow from nukes (VIDEO)". ^ "Air space defence troops". BE: Warfare. Retrieved 17 June 2012. ^ Stukalin, Alexander (May 2012). "Russian Air and Space Defense Troops: Gaping Holes". Moscow Defense Brief. Centre for Analysis of Strategies and Technologies (2). ^ "Don-2NP Pill Box". Global Security. ^ a b "Russia is modernizing the Don-2N radar". Russian Strategic Nuclear Forces. 2007-12-29. ^ Bukharin, Oleg; Kadyshev, Timur; Miasnikov, Eugene; Podvig, Pavel; Sutyagin, Igor; Tarashenko, Maxim; Zhelezov, Boris (2001). Podvig, Pavel (ed.). Russian Strategic Nuclear Forces. Cambridge, MA: MIT Press. ISBN 0-262-16202-4. ^ "Test of a missile defense interceptor". Russian Strategic Nuclear Forces. 2011-12-20. ^ a b c d e Podvig, Pavel (2012-01-30). "Early Warning". Russian Strategic Nuclear Forces. Retrieved 24 March 2012. ^ Podvig, Pavel (23 October 2012). "Very modest expectations: Performance of Moscow missile defense". Russian Strategic Nuclear Forces. ^ "Эксперты рассказали о возможностях новой российской ракеты ПРО". 24 November 2017. ^ "Обнародовано видео испытаний новой российской противоракеты". 24 November 2017. ^ Honkova, Jana (April 2013). "Current Developments in Russia's Ballistic Missile Defense" (PDF). George C. Marshall Institute. Archived from the original (PDF) on 2014-04-26. Retrieved 9 June 2013. ^ "A-235 Samolet-M". George C. Marshall Institute. n.d. Archived from the original on 1 June 2013. Retrieved 9 June 2013. ^ @DFRLab (1 December 2017). "#PutinAtWar: New Russian Anti-Ballistic Missile". Wikimedia Commons has media related to A-135. "Test launch", Function (video) (in Russian), RU, 2011 . "DON-2N photos", Military legacy of the USSR, English Russia, 2012-12-29 .